We’ve got the design expertise and technical know-how! Look at this fabulous job just completed by Outside Concepts Sydney West! The reason we’re all talking about this job is because it illustrates the level of design expertise and technical know-how our franchisees possess. This custom designed and built pergola by Richard van den Broek from Outside Concepts Sydney West, required advanced technical understanding, industry know-how and significant planning, to achieve the quality result. These engineered arches were rolled from 100 mm galvanised steel RHS. To withstand rolling to the required radius, Richard made sure the steel was specified at a 3mm wall thickness and had the sections sand-filled to resist buckling and maintain their shape during the rolling process. 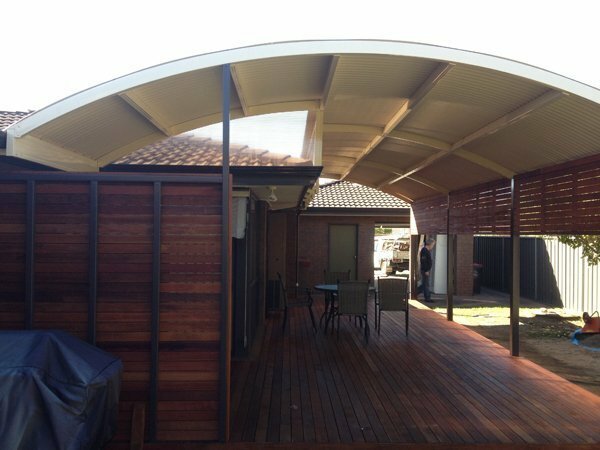 He suggested to the clients they consider reverse rolled corrugated Colorbond sheeting as their roofing material. Reverse rolled corrugated sheet is painted on the underside of the sheet rather than the top ensuring a premium appearance and seamless finishing. For effective weather-proofing, Richard nominated Palram twin wall polycarbonate which was installed using rafter brackets to create a clerestory effect maximising the entry of diffused light. 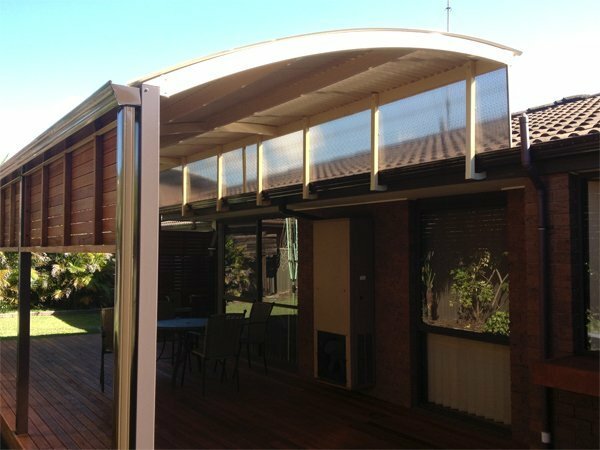 Twin wall polycarbonate provides increased insulation and a level of opacity effective in filtering harsh sunlight and radiant heat compared to corrugated or flat sheet polycarbonates. And finally, Merbau decking was installed directly over the new concrete slab using timber batons dyna-bolted into the slab. This technique is recommended when a deck is close to ground height and there is no room for bearers and joists. Merbau was also teamed as vertical screening, giving the job a neat, co-ordinated and detailed appearance. Richard van den Broek demonstrated he knew really what he was doing when he designed this job. And you won’t find that sort of expertise from just any old bloke with a ute!